After years of drought and devastation of native pines by the bark beetle, and about a century of forestry practice that put out fires as the population in these areas increased, Colorado fires are nature’s way of dealing with the abundance of fuel. It’s hard to believe but it is also nature’s way of regenerating. The heat of the fire is necessary for some species to crack open seeds and provide nutrients for the next growth. Increased temperatures, lower snowpack levels…all reasons to be debated at another time. I have family and friends in Colorado so I’ve been following the news on the wildfires pretty closely. 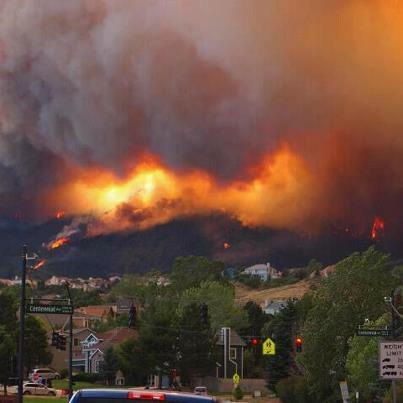 The High Park fire, near Fort Collins where I have several family members, burned over 80,000 acres and hundreds of homes. It is now considered 95% contained, thankfully. But fires further south and west are taking their toll as well. This picture came from Debbi Carlson (daughter of Bobbi for those who knew her). She lives in the suburbs outside Denver and took this picture from her back deck. This was on Wednesday, June 27th and the fire was only 5% contained. Debbi also posted this video and I wanted to share it because it conveys the fury of nature’s work. Those of us not acquainted with what a fire can do will appreciate its power after watching this. It is a time-lapse video run over several days and while it may seem hokey to have it edited and accompanied by music, in the end it is just an incredibly powerful depiction of nature at work–and the unseen swirl of humanity dealing with it below. 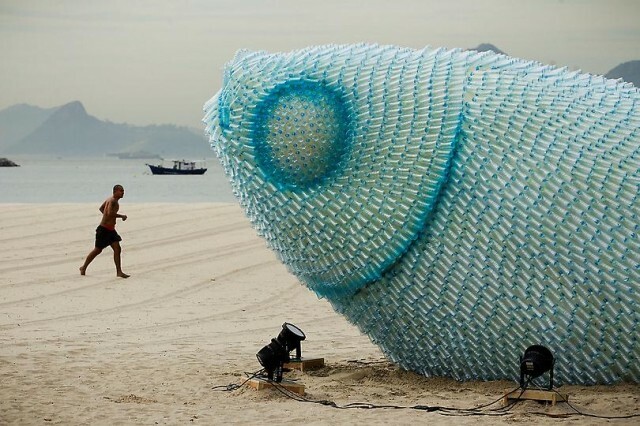 These beautiful pieces of art were assembled on the beach out of recycled water bottles. See more here. While the conference on sustainable development was largely labeled a failure because little to no progress was made on critical issues, this expressive installation will be a startling reminder of the unconscionable waste that continues–at least until the sun degrades it into a gadzillion minute particles that will wash out to sea and join the Pacific Gyre. Be sure to watch this not too long “mockumentary” that is really quite good! Narrated by Jeremy Irons. The Majestic Plastic Bag from Heal the Bay on Vimeo. 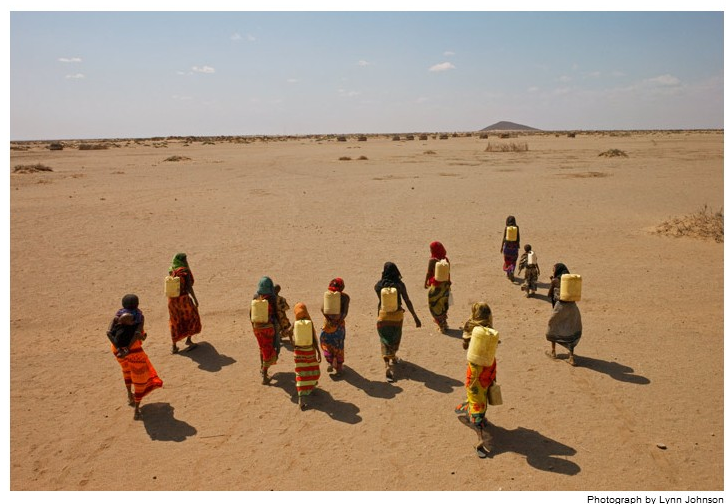 This week marked the 17th anniversary of the UN designated World Water Day. Here are some little known tidbits I’ve gathered to honor it. There are 8.8 million swimming pools in the United States. 2.5 billion people live without a toilet. More than 3.5 million people die each year from water-related disease; 84 percent are children. So, now after all that scary stuff here’s a treat: National Geographic has a special interactive issue dedicated to Water but available for a FREE download. As usual the photos are glorious, some absolutely stunning and the entire issue is full of interesting and important articles. If you don’t mind the standard “sign up” (only name, email and password) then the download is really worthwhile. This is my fourth year participating in Earth Hour. Last year millions of people turned off their lights from 8:30 to 9:30pm; what had started in Australia as a civic event has spread across the globe. 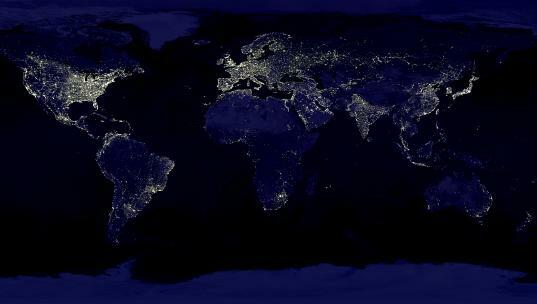 Just think of this: for one hour, millions and millions around the world are nearly simultaneously focused on the planet by the act of turning off their lights. This act of energy expenditure reduction creates an intense sweeping global wave of conscious energy–do we even know what that means? I’ve always thought of the internet as a stepping stone in human development. Earth Hour has become a global event because of our growing interconnectedness and our very human self discovery. 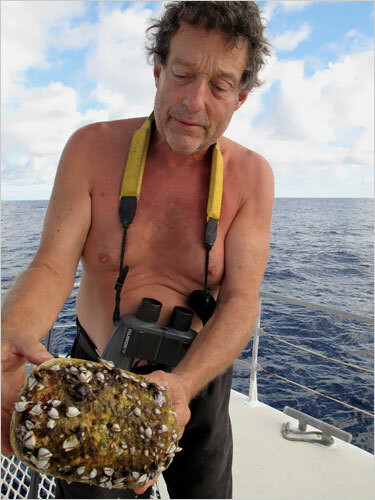 Charles Moore is on his 10th trip to visit the Pacific Gyre–the spot in the Pacific Ocean that holds a growing island of plastic trash caught in its currents, previously written about in this blog here and here. A good article today in the New York Times explains what Mr. Moore has been doing since his first trip in 1997, when he accidentally stumbled upon this phenomenon. His work and that of others has inspired some of the rich and famous to get involved, namely Ted Danson with his Oceana project and David de Rothschild, whose brainchild the Plastiki Expedition he created when he read a 2006 UN report on trash in the oceans. The issue of plastic in the oceans seems to be growing in the public awareness, although can any of us say that something has really changed? When one thinks about the enormous usage of plastic, not only here, but throughout the developing world, it is difficult to see a solution to what may be an insurmountable problem. The plastic doesn’t just float and somewhat degrade into smaller and smaller bits, it is ingested by sea creatures and travels up the foodchain. It is also becoming evident that our casual and regular use of plastic in water bottles and food packaging may be having an insidious effect on us as chemicals leach into our bodies. Nicholas Kristof of the New York Times says tellingly that he has confronted extreme African poverty and disease, as well as dangerous warlords but is frankly terrified of the growing amount of bisphenol A or BPA accumulating in his tissues. Imagine a world where health insurance companies insist that school lunches be healthy and fresh, made with local foods and where the American Medical Association puts its full political weight behind a ban on soda advertising. Imagine that these same players start taking a strong interest in this country’s agribusiness and poise themselves to do some major damage to the subsidized interests in the next fight in Congress over the farm bill. The moment the health insurance industry stops putting its energy and money into preventing health care reform, they will start to relearn what actually will affect their bottom line. Unable to drop people or deny claims we can imagine that they actually will be investing their money in reducing childhood obesity or championing against highly processed food with known cancer-causing chemicals. What is remarkable is that both of these challenges–health care reform and that of agribusiness and the food industry–seemed to be so intractable. What a marvelous insight to set them against each other. Michael Pollan is one of my heroes. Even if you have read “The Botany of Desire” you will enjoy the beautiful nuggets of wisdom he gives in this talk. Our gardening efforts over the past few years have been a great learning experience–about seasons, soil and our particular micro-climate. Now I see it all as just a warmup to some major changes I hope to make, probably starting with the new year. I am being re-educated and inspired by a book loaned to me by my daughter and son-in-law (and I actually think it originally came from his dad.) The book is Animal, Vegetable, Miracle written by novelist Barbara Kingsolver and members of her family. It is their story of trying to eat only or mostly their own home-grown food and/or food available from others living locally. The story is inspiring because it forces you to think about eating seasonally–meaning creating meals based on what is growing now–mixed in with whatever you or others have been able to preserve. This was a wake-up call to me; as you know I have been a hippie/sustainability nut for a long time but somehow I remained perverted by the complete access to a variety of food available at my trusty Von’s and Trader Joe’s. I urge you to read more about what Pollan has to say if you are interested in this subject. His New York Times article “Farmer in Chief” is excellent. He tries to educate the next president in what we need to do with regard to food policy in this country, something rarely discussed. If you start exposing yourself to these ideas it won’t be long before you start thinking there could be some radical changes ahead. And if a long term energy crisis comes our way these changes in purchases and eating habits could become not just the actions of some purists but de rigueur!! The key point here is that food policy is intricately intertwined with global climate change, energy policy and national security! There is much to learn about this way of approaching our family food production. I found this video that is in the same vein as Kingsolver’s book, a little less radical, but also requiring a lot of work. Scott is a landscaper so he spends his days with his hands in the soil. His connection with nature is deep and his acquired wisdom is strong but so simple. Think about the food you eat and where it comes from. It’s not just about organic!